Gerd Leonhard's 2nd book on the Future of the Music Industry. 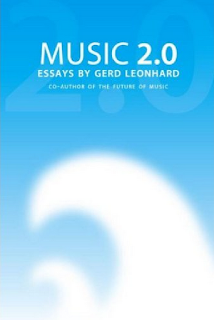 Music 2.0 is an inspiring and invigorating collection of Music & Media Futurist Gerd Leonhard's best essays and blog posts on the future of the music industry. The book continues and expands on the ideas and models Gerd presented in his first book “The Future of Music” (co-written with Dave Kusek, published by Berklee Press in 2005). From his more than 1.000+ blog posts and over 20 long-form essays, Gerd has selected the best essays on the key questions: what are the principles that will define the next iteration of the music business, and what will future success look like?